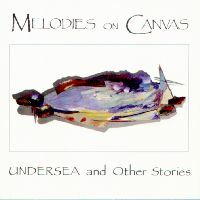 UNDERSEA AND OTHER STORIES is an exciting new concert and compact disc production created and conceived by instrumental duo MELODIES ON CANVAS featuring John Horrocks & William Harrington. This new concert/cd features several new compositions in the new-age/musique actuelle/contemporary instrumental style. The duo's newest work further illustrates their mastery of the classical, 6 & 12 string acoustic guitars, electric guitar and mandolin as well as their innovative use of original samples, analogue and digital synthesizers, and modern signal processing as they continue on their quest to extend the scope of modern instrumental music. The duo's music is founded on an improvisational base where rhythm, harmony, and melody are interwoven to create unique sound paintings. The originality of their music lies in its ability to encompass divergent musical styles and textures. MELODIES ON CANVAS continually integrates themes of foreign cultures into their work creating compositions that are cross-cultural and highly emotive This is instrumental music that is alive and inspiring, exciting and demanding, brought to the concert stage by MELODIES ON CANVAS at an impressively high performance level. The MELODIES ON CANVAS show has been presented accross Canada continually impressing audiences of all ages and critics alike with their high standards of musicianship and their unique compositions. They have recently participated in such prestigious events as the 350th anniversary of Montréal, the Cultures Canada series, and Théatre du Cuivre, as well as concerts in many other established theatres and maisons de culture . "The evening lived far beyond our expectations and without the aid of any chemicals gave us a "mind trip" we'll remember...Both are top-notch musicians who play their instruments with deep feeling as well as technical excellence." The Townships Sun . "The performance you gave well reflected an aspect of Canadian cultural diversity in a contemporary fashion. The Astrolabe's public greatly appreciated Melodies On Canvas. Your show's excellance and encompassing energy contributed to the unsurpassed success that we enjoyed with Cultures Canada 91." Line Gauthier, Coordinator, Confederation Boulevard Events, National Capital Commission. Their first release Melodies On Canvas was released in June 1988 on Empress Records reaching the "number 8 " position in the JAZZ REPORTS top ten new-age chart for two months. It received airplay accross Canada and in some portions of the U.S. on such stations as CHUM-FM Toronto, CJFM-Montreal, CHEZ-FM Ottawa, the CBC network, as well as American Public Radio to name a few. The album also recieved much critical acclaim and was decribed as"...a shining production..." Dimensions Toronto's New Age Monthly May 1989. "There's a tastefullness about the careful multitracking that brings a special grace and lightness to the finished work." The Canadian Composer April 1989. "High standards of musical performance make up the whole album. "The Phoenix November 23rd, l988. "One of the better ones. It has tact, mystery, and a musical language that is more accessible..."This is music to let your head do the walking, and you do the enjoying." Montreal Mirror July l988.